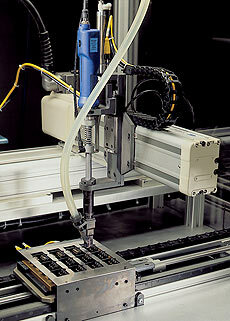 XY Robot Assemblyl Cell | Automatic Palletized Conveyor from Visumatic. Application: Locates pallets, XY Robot drives multiple screw locations, allows for an operator and multiple part bins in this turnkey assembly cell. Visumatic's fastener feeding and driving expertise can be applied in a turnkey assembly cell. An operator loads fixtures by pulling components from utility bins. 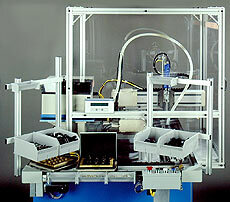 This work station utilizes a palletized conveyor to present parts to the screw driving XY robot. Completed assemblies are unloaded, with the empty pallet completing the circuit by returning to the operator work area. Visumatic's team of assembly engineers exhaustively tests and documents every system, ensuring the XY robot assembly cell will repeatably run production right out of the box. Built Better. Built to Suit. Long Lasting. Robot screw driving assembly station with pallet lift & locate. Installs multiple fasteners and drive location into conveyor fed parts.